When Dreams Don't Work: Professional Caregivers and Burnout presents a fresh perspective on burnout. This book examines the origins and qualities of the dreams (visions) of professional caregivers and the ways those very qualities are risk factors for burnout. 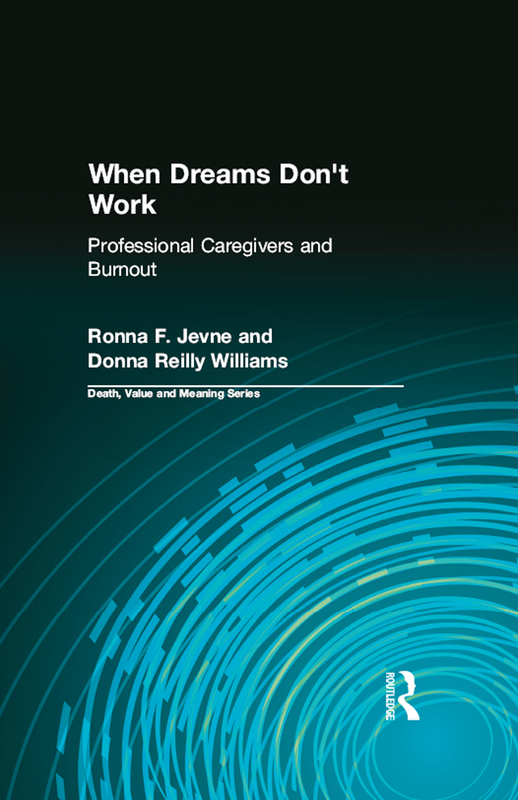 ""When Dreams Don't Work: Professional Caregivers and Burnout"" also looks at the institutions in which professional caregivers (medical, educational, pastoral, law enforcement, and firefighting) invest their professional dreams, and how those institutions contribute to the burnout process. Introduction: Articulates the authors' vision for the bookâ€”offering hope to caregivers experiencing the loss of their dreams, and to educators who want to encourage their students to be as holistic and life competent as possible about their unfolding professional journeysâ€¦an invitation for caregivers to reflect, discern and embrace their own authentic visions. The degree to which each person examines and makes authentic his or her own vision, letting go of whatever is borrowed or inherited from others, is the degree to which they will be able to sustain a career as a professional caregiver in the contemporary environment. Chapter 1: Develops the concept of "dream" or "vision" and the awareness that at the heart of the burnout experience is not a variety of lifestyle issues, but the qualities of the dream which drives the caregiver and the ability or inability of that dream to thrive within the system(s) in which they have invested it. When dreams become broken, burnout follows. Chapter 2: Describes several ways dreams are formed throughout life, and aspects of the dreams themselves which make them more or less workable in the real world. Invites readers to begin to discern their own dreams, where they came from, and how they have (will be) lived. Chapter 3: Describes how, as they develop, many people lose a sense of who they are uniquely, and stop listening to their own inner voices (the "voice of one's soul"). Invites readers to begin tuning back into their own souls' voices and songs. Chapter 4: Some dreams nourish and some deplete. This chapter describes several factors of dreams and invites readers to begin analyzing the factors of their own personal dreams which nourish or deplete them. Chapter 5: Explains some ways the dreams of professional caregivers are uniquely different from others, and the place the caregiver's professional dream plays in personal identity. Invites caregivers to further reflect about their personal inner voice and a deeper sense of personal identity. Chapter 6: Describes the burnout process and symptoms, using a grief model. Chapter 7: Describes the grief process, different styles of grieving, and the healing process. Chapter 8: A chapter about courage and hope. Reevaluating the old dream and assessing its potential for new growth. Beginning to use the imagination and dream again. Assessing one's resources. Chapter 9: Invites readers to recognize the burnout moment as a turning point in life, when they may choose their own direction. Examines the ways the individual spirit is involved with the Spirit of organizations in which dreams are invested, and makes suggestions for the future of organizational development.